We are a group of Senior Bankers and Ex Senior Government Officials who has vast experience in Corporate Banking and SME Banking and SME Government Financial Assistance Aids And SME Incentives since 1989. We manage to raise hundred millions of SME loans and government funds to assist all SME Business Owners at large to grows their business local and globally. We have many SME who first started small and grows very successfully to SME large companies thru our advisory journey. 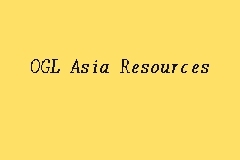 Start share your experience with OGL Asia Resources today!